I learned more about the importance of Play from a bronze medal than any of the races in which I won. When I was asked to do a Tedx talk, I knew that getting a point across in 20minutes – being both informative and entertaining – would be tough. When the Walrus Magazine asked be to be part of their speaker series, WalrusTalks, where the speakers are only given 7minutes!, I was pretty sure that the task would be impossible. But… what kind of motivator would I be, if I turned down opportunities and challenges because they seemed to be a bit challenging! I had to heed my own words, break it down into bits – and… try. The theme that the speakers were given was simply “Play”. I could do anything I wanted to from there. I knew I could have addressed the value of play in the way that structured-play is used by Right to Play around the world to build communities. They use play to educate and empower children and youth to overcome the effects of poverty, conflict and disease in disadvantaged communities. Through Play one can teach important lessons such as disease prevention (HIV, Malaria, and other waterborne illnesses) and inclusion of those are living with those illnesses. I could also have discussed the importance of more unstructured-play for kids (and adults!) in our own communities. Our overly scheduled and observed lives leave less and less room for our imaginations and/or creative problem solving. 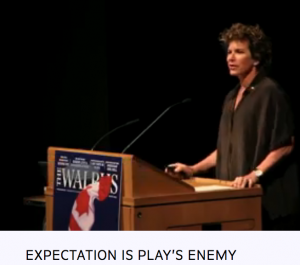 But I decided to address the play that should exist in, but to often is missing from, our work. We all work. Whether that be in the form of a job from which we earn a paycheque, or work as school, sport, raising a family… I don’t believe that work should always feel like a burden or a grind, there should be (must be?!) some part of it that is enjoyable – and even fun. The people, what you get from it (intrinsic), what you get for it (altruistic), the mere act of doing or completing a task.. on any given day it might be different, but when we can recognize some element of what we are doing as enjoyable and even playful – the quality of not only our work – but of our lives goes up exponentially. For my Walrus talk on play, I spoke about about my Olympic bronze medal, the one of four Olympic medals that I have that is not gold. I shared my observations that what was missing from that race was joy. Play can exist in the hardest most challenging things that we are doing. It doesn’t have to be all skipping and smiles, it can be as competitive and focused as you choose. Try not to feel burdened by the expectations that come with work, but rather lifted and inspired by those expectations. Learn to frame joy and play as YOU like it. It’s only 7 minutes… well – okay – I failed there… It’s about 11minutes, but it’s fairly short and to the point. This entry was posted in What I'm thinking (Thoughts and opinions) by Marnie. Bookmark the permalink.